There is a long debate on whether attic fans are good or bad solutions for homeowners interested in cooling their homes and saving on air conditioning costs. The research from authorities such as the Florida Solar Energy Center shows that attic fans costs more to operate than they energy they save and there are additional safety concerns to running these units. There has also been research on solar powered attic fans specifically that shows the financial payback is limited. The consumer reviews on attic fans are very positive – consumers report that they are easy to install, increase comfort in hard to target rooms and reduce AC usage. At ~$400 a unit, these are not cheap, but with an easy installation and positive customer reviews, it may make sense for some homeowners to try them out. This guide summarizes the research findings on the effectiveness of attic ventilation and solar powered attic fans specifically and answers important questions on solar attic fan installation, purchasing criteria and sizing requirements. Our recommendations are based on 20+ hours of customer research, discussions with installers and industry research reviews. Our recommendation for homeowners that are interested solar powered attic fans is the 36-Watt Florida-rated Solar Attic Fan from Natural Light. The customer reviews of the Natural Light are very strong, highlighting the quality of construction, the ease of installation and the effectiveness in reducing attic temperature. The Natural Light fan comes with an industry-leading 25 year warranty and that is backed up by customers reporting it withstands the strongest of wind and hail storms. The unit also has an add-on (~$20) thermostat, so it only operates when the temperature reaches a certain point. The Natural Light unit has to be installed on a roof, so if you are looking for a gable unit and want to spend less then $200, we recommend the Amtrak 40 Watt Solar Attic Fan. Are Solar Attic Fans Effective? There have been several studies on the effectiveness of solar attic fans and Green Building Advisor does a good job of explaining the research, which we have also summarized here. The Florida Solar Energy Center released a study many years ago (1985) titled Fans to Reduce Cooling Costs in the Southeast. The conclusion was that attic fans cost more to operate than they save in energy and that a house with normal ventilation and good ceiling insulation does not need attic fans. Partially in response to this conclusion, the fan manufacturers came out with solar-powered versions and follow-up research was conducted. The conclusion of the Performance Assessment of Photovoltaic Attic Ventilator Fans study (1997) was that while the attic fans reduced the attic temperature by over 20 degrees and air conditioning costs by 6% (a 1,050 sq. ft house), the annual savings of $40 was a long payback (+20 years) for a system that could cost $800 after installation. But a lot has changed since the study was done in 1997 – solar panel pricing has decreased by nearly 70% and electricity prices have gone up (not as much in Florida). There are some units available for under $200 that would cover a house 2x the size in the study, so even with those assumptions a solar attic looks more attractive ($80 of savings or 2x the study example and a payback of 2.5 years if you self-install). You may also live in an area that has higher electricity prices compared to Florida or you may just want to breakeven on the system and reduce your greenhouse gas emissions. Lastly, another concern mentioned by several opponents of solar attic fans is that flue gases from appliances such as a natural gas water heater can be backdraft into the house. This is a real concern and potentially dangerous, so should be analyzed by a professional if you decide to install a solar attic fan. 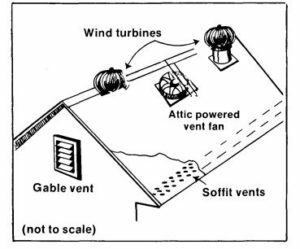 An attic fan works by pulling warm air out of the attic to allow for cooler air to come through the gable or soffit vents to reduce the air temperature in the attic. By reducing the air temperature in the attic, cooling demands in the rest of the house can be reduced. Proponents of attic fans also claim that a more moderate attic temperature can also extend the life of roofing materials, although that is harder to prove and more likely driven by the UV exposure of the roof. A solar powered attic fan does just want the name implies – these are attic fans with attached medium-sized solar panels. When exposed to sunlight during the day, the panels will generate electricity to power the DC motor in the unit and turn the fan. Although they only run on solar during the day, some units can be connected to batteries to run at night. So the solar powered units provide the same benefit as a normal attic fan, but have zero costs to operate. 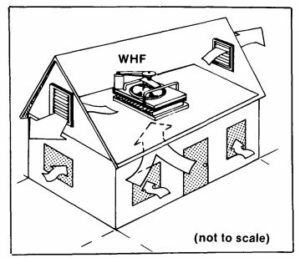 Solar attic fans ability to move air is measured in cubic fee per minute (CFM) and a good rule of thumb that manufacturer use is that 1,000 CFM can handle a 1,600 square foot attic (1.6 square feet per CFM). Most of the models that we reviewed could handle more than 2,000 square feet, which should cover most attics. The other important measure is the wattage of the panels, which are measured in watts and based on standard operating procedures. So be aware that if your roof does not have adequate sun exposure, you may not generate enough power to run the fans. Check out the solar radiation in your area using the Department of Energy’s database. A solar attic fan should not be confused with a whole house fan, which has a different use case. 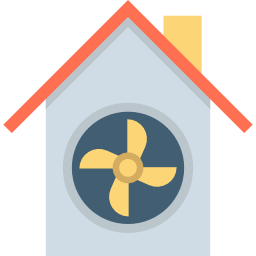 While an attic fan removes hot air from the attic through the roof, a whole house fan removes hot air from the house through the attic and allows for cooler air to come in through the windows. A whole house fan is mounted in the attic floor with a metal grill in a main hallway in the house. A whole house fan is ideal for desert/arid climates that have cooler nights and can be run at night to cool the house off in lieu of air conditioning. They are ideal for houses that do not use air conditioning at all, as it does not make sense to draw cooler humid air into the house at night only to close windows and turn the air conditioning on during the day. Solar attic fans quality for the Federal Residential Energy Credit, which gives homeowners a 30% credit for the cost of the equipment and installation. You will need to have the tax exposure to take the credit, so check before purchasing. In addition to the federal tax credit, there may also be state/city or utility rebates or tax benefits (check the DOE’s database here). If you have basic tools and handyman skills, installing a solar attic fan can be an easy 1-2 hour long project since there are no wires associated with running the motor. The hardest part is finding the best place to mount the solar attic fan. You will also need a sawzall if you are installing in the roof (some units can be installed in the gable). It is also important to properly seal the fan to avoid water and air leaks. There are many helpful videos on youtube from DIYers and manufacturers. Natural Light Solar Attic Fan Review – Premium Model Made in the U.S.
Natural Light is based in Phoenix, AZ and has been manufacturing solar attic fans for commercial and residential applications since 1999. The Natural Light fan is a pricier unit, but the reviews and features seem to justify the cost for many consumers. The unit comes with an industry-leading 25 year warranty while others only have 1-10 year warranties. The warranty is also backed up by customers reporting it withstands the strongest of wind and hail storms. Note that if you want to have the unit operate automatically, you will need to purchase an add-on (~$20) thermostat (most consumers choose this route). The customer reviews of the Natural Light are very strong, highlighting the quality of construction, the ease of installation and the effectiveness in reducing attic temperature. Amtrack Solar is based on California and is solely-focused on solar attic fans. The Amtrak Solar Attic fan is one of the lowest cost options available, but has strong reviewed and is an Amazon Choice product. The unit is a different construction than the other models reviewed in that the panel and the fan are completely detached. This works best for installing the fan in a gable vent and the kit comes with an extra 15 feet of wire for connecting the two. The Amtrack is a truly DIY kit and some consumers report that the installation is not as straightforward as expected, so the panel/fan packaged units may be a better fit if you are not comfortable with the installation. Overall the reviews for the Durabuilt are not as strong as the other models. The warranty is not as long as the other models and some consumers have complained of it breaking shortly after purchase (although customer service response was good).The Durabuilt has the lowest wattage of the models that we reviewed and as a result will handle only 1,850 square feet of attic space vs. 2,000-2,500 square feet with other models. This may be enough depending on your attic space and you don’t have to pay up for one of the larger models. Not manufactured in the U.S. The HQST solar attic fan has 30W panels, but the same square footage coverage (~2,500) as the Natural Light model. Unlike the other manufacturers that we reviewed, HQST offers many other types of solar panel products – solar panel kits, smaller device chargers and even portable solar chargers. HQST solar attic fan is a newer product for the company and was released in 2017, but early customer reviews have been positive. At a lower price point than the Natural Light, it is worth considering. The HQST panel also has the flexibility to detach the solar panel from the fan and mount remotely for optimal sun exposure. The panel can be adjusted up to 45 degrees as well. The Remington Solar attic fan is American-design and uses a coated steel design. Unlike other models, this fan comes with a built in thermostat and humidstat (vs. an add-on for other models). The Remington Solar attic fan comes with an unlimited lifetime warranty, although it is unclear how long that lasts. The company claims that its solar attic fans are the least-expensive high-quality fan feature-for-feature. The Remington also has a brushless DC motor.